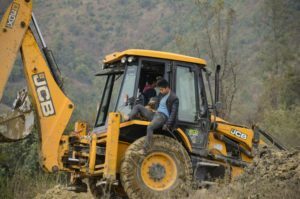 Construction for the Community Life Center at Saikot continues! We are really grateful to have the opportunity to be on this lovely journey and we feel blessed to be able to present you some of the developments on this potentially beautiful project. Last year, we had the joy of finishing with ground-breaking and Outdoor Athletic Facility (Phase 1) Grading. So, now, let’s take a look at what has been accomplished through this year! Firstly, we have been working on retaining a wall on three sides of the outdoor soccer field. That required 46,000 bricks (!) 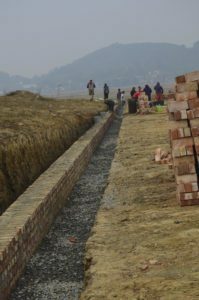 Moreover, we covered the need of drainage ditches to divert water runoff away from the field. That was a really important issue and we’re thankful we managed to solve it with approximately 800 feet of cement drainage ditches. To finish the retaining wall, finish drainage ditches and backfilling before rainy season that begins in April/May. What is more important than the construction itself though, are the actual project goals that motivate us and the rest of team! We aim to provide a state-of-the art facility for the young people in the community to enjoy and to develop their talents. We want this to become a positive, wholesome environment where young people can spend their time. Alongside all these, providing jobs for local people of the community helps us to be continually engaged with it and focused on the goal! Our hope is that we will have more news and more pictures to show in the near future! We would like to thank everyone that has helped us with words of encouragement, prayers and practical help. This work is not only ours but everyone’s! We can feel your love and we can hardly wait to share with you the plans that the Lord has in store for our organization and the local community.